The latest 4th generation Apple TV from Apple, was a great successor. This created a new opportunity for Apple to bring apps to the TV screen and created a new place in the home entertainment sector for Apple. Although google tried to create an App market with the Nexus player, it did not see the same amount of success. The same cannot be said for the Google Chromecast, which has multi-platform support and created a new market for google in the Budget Streaming devices. Back to the Apple TV. Unlike its predecessor, it does not have an Optical out port, rendering it not useful for an Home Theater system nor does it have an 4K model. Although some might say that 4K and UHD are still not standards, it could have been a good upgrade. But the new TV has Siri, an improved (but sensitive) remote, an App Store and a more optimized OS for a TV. The Macbook is a portable ultrabook launched in 2015 by Apple Inc. This was a revamp of the Macbook after the model was discontinued in late 2011 as the Macbook Air surpassed the sales of the old Macbook. The new Macbook is a very thin and portable ultrabook, packed with the Retina Display and the new “Intel Core M” processor, a processor targeted for mobile devices. It contains the new USB type C port, which is the reversible USB port. The port is used for both data transfer and charging (eliminating the MagSafe), making the Macbook much thinner than the Air. I will be reviewing the Macbook (MK4N2HN/A) Gold Color. Since I am in the Indian market, the option to customize is unavailable thus my experience may be a bit different than yours. If we look at the design of the Macbook, it resembles to the Macbook Air with the aluminum body and the frame but has reduced in thickness due to the elimination of most USB type C ports. The keys on the keyboard are much bigger and are spaced out a bit more, to handle the big fingers. It feels a bit unstable due to the very light weight and the design is not sturdy if you are holding it in your lap. The laptop feels slippery and you have to be very careful, since it is a delicate product and dropping this computer can easily cause some dents and scratches to occur. The keyboard does not have a lot of space, thus it is hard to push hard with the keys since there is not a lot of space. The keys are very thin and a bit of pressure feels like you are directly hitting a hard surface. The force trackpad however, is an amazing improvement since you are now able to make different actions based on how much pressure is placed, just like the force touch on the iPhone 6s and the Apple Watch. In terms of the Operating System, the laptop came shipped with OS-X 10.10 with the latest features, like forwarding SMS or receiving calls from your iPhone (Handoff). The OS is extremely fluid and is very responsive to user actions. Since the laptop has the Intel Core M, the processor is not designed to run applications like photoshop, but is designed for just checking email and creating documents. It does its job very well, and is a perfect travel Ultrabook. The performance of the laptop is very solid, since it loads all the safari pages at light speed. Mail works like a charm and it comes pre-loaded with iLife and iWork software. The laptop is designed for minor tasks, and running heavy software like Premier will slow the laptop down to snail’s speed. It is not designed for heavy tasks and for its price bracket and purpose, it is amazing. The new technology. USB type-c. This is the replacement from MicroUSB and USB-A to USB type C. Using a conventional pen drive requires this adapter. USB C to lighting cables are also available, but currently it is better to use the USB C- USB A adapter. I have bought other adapters, but the finishing of the Apple adapter is much better than the rest. I personally do not like the change, since I have to carry this adapter in order to use the device anywhere outside my house. I also have to buy multiple adapters for converting USB c to connect to my Apple Cinema Display, which makes it much harder to use on conventional displays. Recently, Apple has launched an upgrade of the 2015 model to the 2016 model and has made the specs even better for the lower price. A rose gold option is also launched and now is available. Make sure you buy the 2016 model and not the 2015 model. This review is for the 2015 model. Overall, the laptop does it’s purpose of being an ultrabook and runs Mac OS-X at amazing speeds. It may not feel as powerful as a MacBook Pro or as fluid as a MacBook Air, but at a low start price for an Apple product, it does what the everyday consumer needs. This device is designed for people to carry their laptop around like their iPad, having a proper computer with them in a portable device. Apple has done a great job with the MacBook but improving the processor from Intel Core M will help making the device more powerful. Apple CarPlay, is a new auto infotainment system in cars has just arrived in the Indian Market. I will be testing the new system today in the Maruti Suzuki Ciaz. CarPlay was introduced with the iPhone 5 in iOS 7 and today has evolved to support a limited range of 3rd party apps like Spotify. This review will be of the Wired CarPlay system. The CarPlay is integrated with the stereo and the steering controls. If we look at the current scenario, in India, only certain select models have this feature and thus, it is a very niche product. It is also very limited, since Apple does not provide the maps feature in the Indian market and makes the system very limited. Still, the integration with Siri and the overall concept does make it very useful, if you have an iPhone. Phone, Messages, Music, Podcasts, Audiobooks and a Now Playing section . The phone app showcases a similar screen with the different options like Favorites and recent calls, just like your iPhone screen. The incoming calls on the CarPlay screen allow for you to do everything you would on your iPhone, including starting conference calls. The system allows you to use many features of your iPhone’s phone app in the car. The messages app is really weird, and only showcases your last messages. If you need to reply to any message, just like the Apple Watch, you will have to take the help of Siri. In poor cellular integration areas in Delhi, Siri just stops working and thus, it is impossible to reply. 3rd party messaging apps like Messenger or WhatsApp are still not supported. The now playing app shows music or video data and is an indirect way to support 3rd party audio applications, with the music and volume controls on screen and on the steering wheel. The music, podcast and audiobook apps mirror the ones on the iPhone and show all the tabs and includes integration with Apple Music. The podcasts app provides updates with latest entries while the audiobooks is an offshoot of the iBooks app, showing the supported audiobooks to be played through the cars audio system. There is also support for 3rd Party apps. I tested Spotify and saw very good support for 3rd party apps. Only 3rd party audio related apps exist for the Apple CarPlay. On the sidebar, it showcases vital stats like the signal strength, the cellular network and the type of internet connection being used and the current time displayed on the iPhone. Overall, I have used CarPlay and have felt that is a huge step from Apple to integrate iPhones into automobiles.There is one down sight though, there is always a problem with CarPlay integrating with the audio from iPhone calls and it does not work. This could be specific to my unit, but in general, it has a lot of bugs that need to be amended before calling it a “polished” apple product. The Apple Watch, one of the most popular wearables by Apple, has reached out far enough to grab my hands on it and for the past few months, I have had a daily interaction and this is my take. Note that I live in India and the NFC Chip and Apple Pay is irrelevant (although it is a great feature) so it will be omitted in my review since I have not used it. I will be using the 42MM Apple Watch Sport Edition with the white sports band. This is a in depth review, so if you do not want to read a lot… The summary is right at the end. So first, let’s see if it stand the test of time. Since the Apple watch has been my daily driver, I have seen the physical progress of the watch. It has gone through the wear, tear and the occasional drops yet it has only had some minor body scratches. Since the screen was not sapphire but Ion-X glass, there are a lot of minor scratches which is a disadvantage of this Edition. Though I was impressed with the actual watch, the white strap was a huge letdown. From the pristine white color, it is now in progress of turning grey with a hue of blue. The strap could not handle the extreme Indian weather and the fact that no official accessory is available at any (so called) iStore in India does not feel good. For the strap, I would recommended the black color, since it has higher durability than its white counterpart. The watch is also very thick and becomes heavy and I feel that if the watch was thinner, it would have felt more like a watch. In terms of the software, it mimics the home screen of the iPhone with the apps in a small circular icon. Though there are a lot of applications available, all of them are dependent on the iPhone and have a lot of loading time. This defeats the purpose of quick actions on the Apple Watch and most applications take a very long time to load. The one place the watch achieves its purpose of quick actions are the notifications, which have reply options where you can just “speak” your reply for messages. If you have a lot of apps, then your watch would become very clunky and would be very slow. The digital crown is like the “home” button, used to maneuver around the Apple Watch. You can zoom, scroll and select elements with the digital crown. There is another physical button, which brings up the list of your friends in a circular diagram and you can maneuver your list of friends using the digital crown. The watch faces are very limited though, since they are only a few that are provided by Apple and you have to live with those. That is where the Apple Watch has a limit of customization. There are many features, but one of the most relevant feature is the forwarding of iPhone calls to your watch. In this, any calls (including FaceTime calls) can come from your iPhone to your watch and you can speak directly to the person through the watch. The call quality is amazing and it is a really cool feature. The apple watch mimics your iPhone and uses bluetooth and Wi-Fi to connect to your phone. The apple watch is marketed and designed as a fitness product. It reminds you regarding when to stand up and alerts regarding other fitness related goals. It uses the latest HealthKit technology to get haptic feedback and user inputs regarding multiple health issues and tracks your sleeping patterns and heart rates. There are several sensors, most notably the heart rate sensor, which keeps data in the heath app and provides you with historical feedback. The consumer can also send that data to partners with HealthKit, so that they can provide feedback regarding certain health problems. The apple watch is a companion device which requires the iPhone to be on you. It lasts about 1 full day with a overnight charge. The taptic engine provides feedback with subtle vibrations so that you do not missed all the mirrored notifications from your iPhone. The models and pricing vary based on size and band. 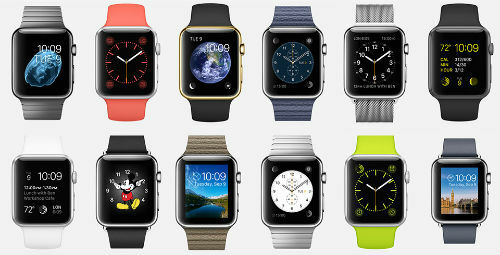 42mm models are $50 more expensive than 38mm models, and bands vary in price from $49 to $549. Apple offers more than 40 Apple Watch and band configurations, which it has changed every six months or so with the introduction of new bands. The apple watch edition is 24k plated gold and starts around $10000. Overall, I feel that the Apple Watch is something that is a very good attempt for Apple for capturing the wearable market. Though its lackluster battery life, limit of customizations and lack of feature international does not suite every consumer, it is great for people who are diehard apple fanboys. Also, the integration of the Watch into other apple products is something that makes this product a great buy. Overall, if you are a heavy fitness user or a would just like to try it out, give it a shot, because it is only 349 and it is a smart watch.